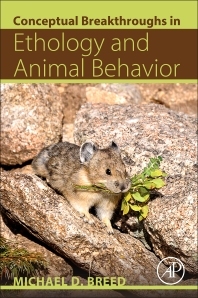 Conceptual Breakthroughs in Ethology and Animal Behavior highlights, through concise summaries, the most important discoveries and scientific revolutions in animal behavior. These are assessed for their relative impact on the field and their significance to the forward motion of the science of animal behavior. Eighty short essays capture the moment when a new concept emerged or a publication signaled a paradigm shift. How the new understanding came about is explained, and any continuing controversy or scientific conversation on the issue is highlighted. Behavior is a rich and varied field, drawing on genetics, evolution, physiology, and ecology to inform its principles, and this book embraces the wealth of knowledge that comes from the unification of these fields around the study of animals in motion. The chronological organization of the essays makes this an excellent overview of the history of animal behavior, ethology, and behavioral ecology. The work includes such topics as Darwin’s role in shaping the study of animal behavior, the logic of animal contests, cognition, empathy in animals, and animal personalities. Succinct accounts of new revelations about behavior through scientific investigation and scrutiny reveal the fascinating story of this field. Similar to Dr. John Avise’s Contemporary Breakthroughs in Evolutionary Genetics, the work is structured into vignettes that describe the conceptual revolution and assess the impact of the conceptual change, with a score, which ranges from 1-10, providing an assessment of the impact of the new findings on contemporary science. An excellent history of the study of animal behavior.